This was great until it came to the embed feature and you have to upgrade to a purchased subcription. Ms. L. You do not have to upgrade to a purchased subscription to embed a ThingLink image. I embed images all the time and I am using the free version of the tool. Just click on the embed symbol you see on the left side of the image and copy the code then paste it into your blog or website. I'm happy to chat with you more about this so please email me ff you are not getting the embed feature to work. 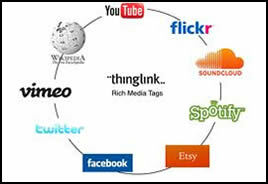 Thanks for sharing ThingLink. Ran across one of your posts in Twitter talking about it and gave it a try! My Social Studies teacher was pretty excited! Thanks again for taking time to share! So glad you liked ThingLink! Really glad to share one of my favorite tools!